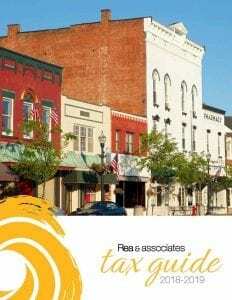 Rea & Associates' 2018-19 Tax Guide provides taxpayers with insight into the most current tax rates and provisions from the state and federal government. In addition to individual income tax rates and access to the State of Ohio's income tax table, this guide features retirement plan contribution limits, education credits, child and family tax credits, social security benefits, and more. Download your copy of the 2018-19 Tax Guide today to ensure that you can always access this helpful tax resource throughout the year. Our tax guides are updated every year. So be sure to check back next January for the newest version.